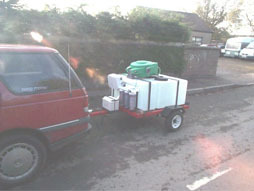 Full trailer system from £2595 + VAT, everything you need for water fed pole window cleaning. 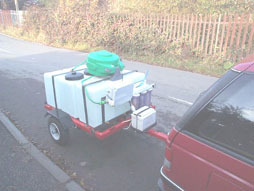 This trailer system which the window cleaner will pull with his car or van will clean for around six to eight hours before needing refilling. The water tank has a 400 litre water capacity. Just hook up to your car or van and away you go. 4 Stage reverse osmosis water filtration 300gpd, or Deionization and hand held water meter. Includes pole to reach 40 feet, Autobrush, 100m hose reel, hoses, battery, pump box with 100psi pump. Can be towed with any small car. Can be taken almost anywhere. Automatic shut off valve when tank is full. Same power as van mount system. Has it's own independent battery which will run your system all day. This window cleaner system has everything included to reach and clean up-to 40 foot you have nothing else to buy. Ideal for the window cleaner who uses his car. This pure water window cleaning system can also run two poles from the pump at the same time. This trailer window cleaning system can be seen in use in this window cleaner video demonstrations. (Total size about 2 megabytes). The above fill times are approximate, and depend on water mains pressure. The higher the pressure the faster the water will be purified. If you think 375L of water will be enough for your days window cleaning then the 300 gallons per day will do you. The above system takes around 8 hours to fill the tank. The 800gpd is the one you want if you need to produce water that bit faster, handy if you are doing mostly large commercial work (with a tap nearby of course). The 1200gpd is the system you need if you are planning to have two men working from the trailer at the same time, again handy on large commercial buildings. the trailer system can wash to a distance of 200 feet, and reach windows to a height of 40 feet, then pull the trailer to a different location if needed. Please visit our Forum for window cleaners and discuss the use of water fed poles with fellow window cleaners. You can also visit our FAQ page for answers to any queries you may have. We have window cleaners registered from around the world.